Welding cable are highly durable cable that are resistant to abrasion, heat, cold, solvents, sparks, oil, tar and ozone. 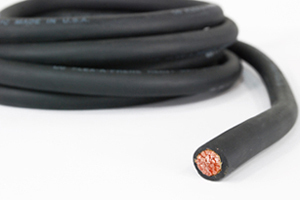 Welding leads are different from other cables in that they are made primarily for arc welding tools, which requires the cable to be durable as well as flexible. Welding leads are made with smaller gauge wires woven together as opposed to a single solid wire. By having many smaller strands of wires, it allows the cable to be more flexible, since stranded wires are generally easier to bend and manipulate without breaking or damaging the wires. Welding leads are also highly durable due to it being insulated with a very rugged rubber insulator made from either PVC, Neoprene or EPDM. Welding leads, with its tough rubber insulator, are manufactured to be resistant to moisture, water, grease, oil, as well as other chemicals. However, one thing to note is that different insulation jackets yield different level of resistive properties. EPDM insulated welding leads have a low resistance to grease and oil. The temperature rating depends on the gauge of the wire leads. The thicker the wire, the higher temperature ratings the wire can handle. Different welding cables manufacturers can also have wire that performs beyond the mentioned rated temperatures. The different parameters are usually printed on cable itself. The protective rubber insulator of welding leads can withstand a wide range of temperatures, depending on the elastomers used for its insulation. EPDM has a max temperature rating of 105°C to 140°C and a low of approx. -50°C, while Neoprene has a high temperature between 90°C to 120°C and a low of approx. -40°C. Although EPDM and Neoprene have a wide temperature range, welding leads are usually rated on the lower end of the temperature ranges. PVC insulation jacket temperature rating varies from manufacturer to manufacturer. Different manufacturers have their PVC rating with a max temperature rating between 80 to 120°C and a low of -20 to -55°C. What cause welding leads to wear out? Welding leads usually last a very long time and have excellent resistant to abrasion, physical and mechanical as well as chemical contacts. Welding cable can last anywhere between 5 to 10 years. However, with proper handling, welding leads have been known to last far beyond the typical 5 to 10 years. Welding leads are less resistant to oil and petroleum based fuel. Exposing the welding leads beyond these limits can damage the cable. Companies that specialize in selling wire usually have specific welding machines that can repair welding leads. If the cables have minor damage, you can try wrapping the cable and apply heat shrink tubing to the damage areas. If the cable is damaged to the point where this repair method is unusable, you can have company that specialize in repairing cable to try and replace the insulator, by removing it from the damaged lining, and threading it through a new lining. View our selection of welding cable here.